One of the rewards of enduring my family's five hour seders were the farfel muffins made by my Grandma Jean who made these (and everything else) from scratch. 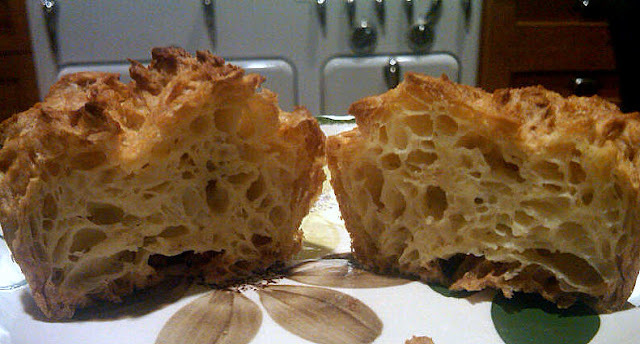 Her farfel muffins were like a Jewish version of Yorkshire pudding, very light and almost hollow on the inside. As you can see, my muffins, while delicious, haven't yet achieved the high standard my grandmother set. I'm lucky to work just a few blocks away from the Streit's Matzoh factory on Manhattan's Lower East Side, which has a retail shop attached, as I was unable to find farfel in any of the grocery stores in my Park Slope neighborhood. 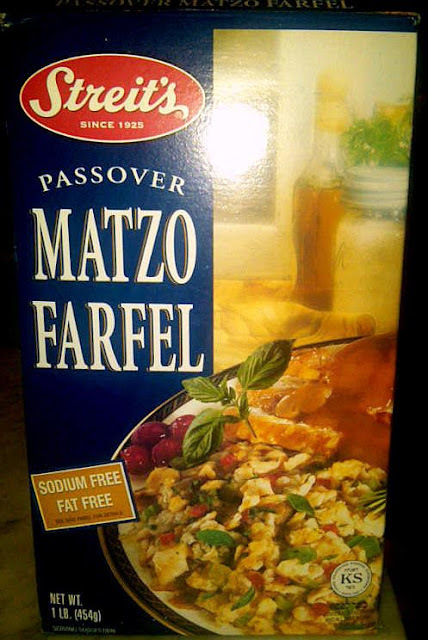 Matzoh yes, farfel no. These muffins, from my mother's recipe (below), are very easy to make, and almost impossible to stop eating. 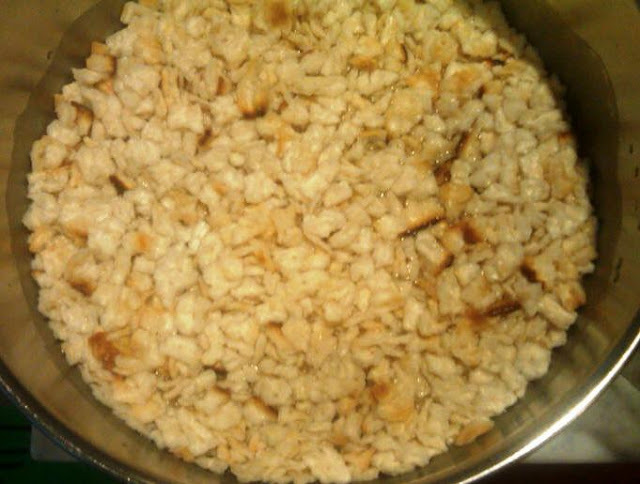 Soak the farfel in water and then drain before proceeding with the recipe. My mother's recipe. When I took this recipe card, she said, "Mine were never as good as Grandma's." Luckily I have eight days to get these right. @ABA: DH will have something even better for you tomorrow! 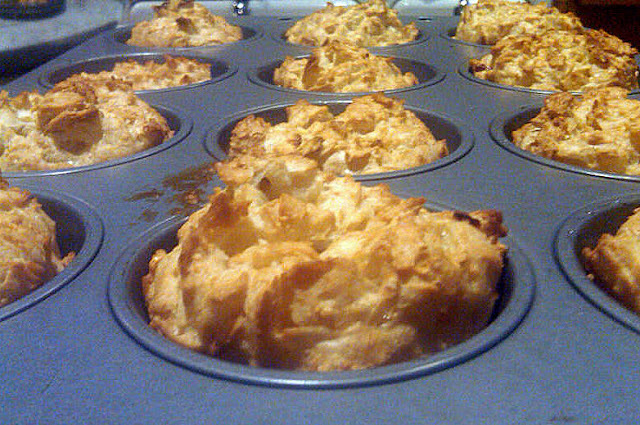 I love these and even made them myself a few times. When I was not eating yeast, your grandma would send us home with a bag full, along with a melon and other things she insisted we take. I wonder who got that "snack set for 12" she pushed on us for years! Farfel is impossible to find here too. Farfel is just crushed Matzah. I never buy it - I just make it myself. I just take matzah and break it up with my hands. It's worked well for the last 32 years. Thanks for writing and apologies for my delayed response. Bravo to you for making your own. 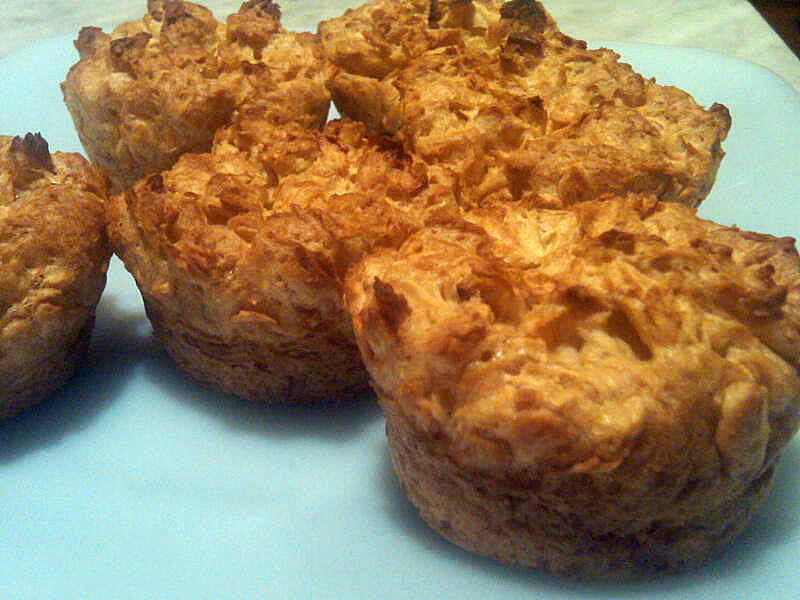 I'm lazy and fear never getting the pieces in a uniform enough size (some too big,others too small) for this recipe. Plus, I like to support the local matzo place, it's such a throw back. Hope it's okay to post..... I'm not Jewish and I live way down south. 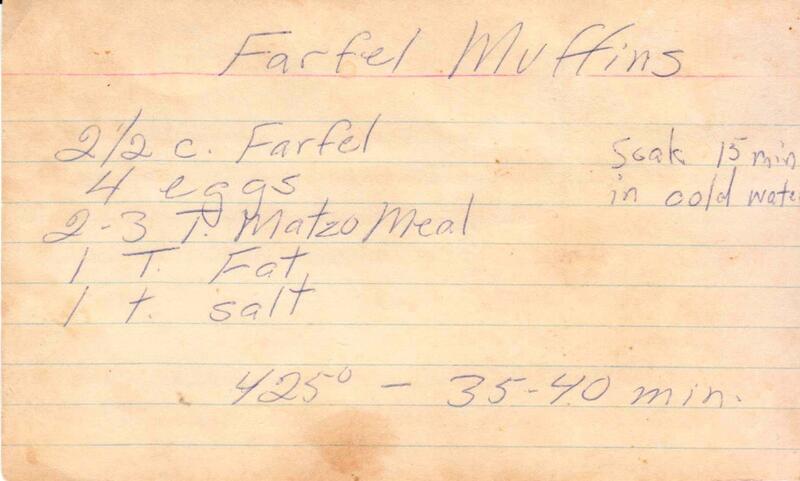 The muffins look delicious, but if Farfel is just crushed Matzah, what is Matzo meal in the recipe above. I'm not sure if these items are in the stores here. I'll look, but please give me an excuse on not knowing. Farfel is crushed matzo -- the pieces are about the size of peas (but flat). Matzo meal is matzo crushed fine, nearly as fine as flour. (That I either purchase or grind in a food processor.) You can make your own farfel, but I'm lazy and the farfel in the purchased product has a uniform size that's difficult to achieve at home. I think -- I've never tried it! Thanks for writing! Very excited to try these. They are in the oven!